Vitamins that make you feel and look great. Having a healthy diet and lifestyle is really the best way to ensure health for the future. When you’re not able to eat a perfectly balanced diet, vitamins and minerals is a good way to help make sure your body get what it needs. 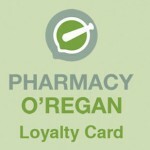 Pharmacy O’Regan carries an extensive selection of vitamins and minerals matched by the extensive knowledge of our pharmacists and staff. So before you begin any new supplement regime, talk to us to find the best possible solution for you.